is a traditional Mongolian bowed stringed instrument. It is one of the most important musical instruments of the Mongol people, and is considered a symbol of the Mongolian nation. The morin khuur is one of the Masterpieces of the Oral and Intangible Heritage of Humanity identified by UNESCO. It produces a sound which is poetically described as expansive and unrestrained, like a wild horse neighing, or like a breeze in the grasslands. 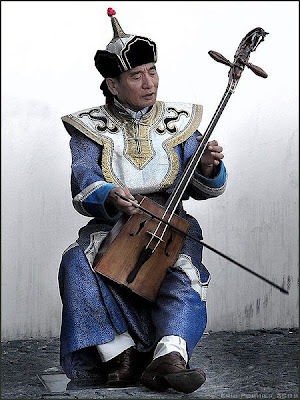 The full Classical Mongolian name for the morin khuur is morin-u toloγai tai quγur, , (which in modern Khalkh cyrillic is Морин толгойтой хуур) meaning fiddle with a horse's head. Usually it is abbreviated as "Морин Хуур", Latin transcription "Morin huur". In western Mongolia it is known as ikil (Mongolian: икил—not to be confused with the similar Tuvan igil)—while in eastern Mongolia it is known as shoor (Mongolian: Шоор). It is known in Chinese as matouqin (馬頭琴 or simplified 马头琴}), batookin in Japan 馬頭琴.
. The Japanese Koto 琴 . ***** . Music and Haiku .